The International Radio Controlled Helicopter Association’s IRCHA Jamboree is a helicopter event like no other. Each year, fliers travel from around the world to attend this unique event at the AMA’s International Aeromodeling Center in Muncie, Indiana. The Jamboree is known for amazing flying demonstrations by some of the world’s best 3D pilots, but unlike most pure 3D competitions, pilots of all skill levels are welcome. From micro helis to Giant Scale masterpieces weighing up to 50 pounds, the Jamboree really has something for everyone who loves helicopters. Although this year’s Jamboree, held August 1-5, 2018, was slightly smaller compared with years past, there were still more than 500 registered pilots and hundreds of spectators at the gathering, and the flightline was always busy. Electric has become the predominant power system for RC helicopters from micro to Giant Scale, but nitro continues to have a loyal following. This year, longtime electric supplier Mikado USA announced a new Kyle Dahl-designed 700 Nitro heli, so rotary flight continues to offer something for everyone. Although pilots of all levels are welcome to fly, the IRCHA Jamboree is famous for eye-popping flying competitions. The most coveted of these is the Battle of the Brands, in which factory pilots of Platinum and Gold sponsors square off head to head. 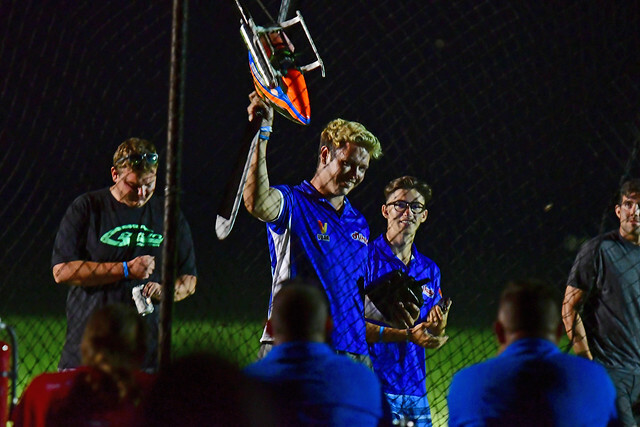 The quality of flying in this contest was truly mind-boggling, but when the dust settled, Nick Maxwell of Futaba successfully defended his crown. Everyone loves night flying! This year there were two night-flying competitions: one for helicopters with onboard LED lighting, and a second contest beneath floodlights. There’s something really wonderful about night flying, and the elite pilots put on an amazing show. In the “under-the-lights” competition, Kyle Dahl wowed the crowd to take top honors. The event also features the IRCHA Speed Cup, in which high-performance helis race though a speed trap, with the best left and right pass averages used for scoring. Miles Dunkel, from Germany, has mostly dominated the Unlimited class, and this year was no exception. Miles is a super-smooth flier, and his east and west passes averaged slightly less than 200 mph. The Scale venue is located in the southwest corner of the site, and a large tent is provided for all of the Scale pilots, whether they’re competing for the IRCHA Scale Cup or just flying for fun. The relaxed, informal atmosphere at this venue is enjoyable, and you can see some museum-quality Scale models up close and personal. There are many great flying events scattered across the country, but the IRCHA Jamboree is the one can’t-miss gathering on my calendar. The organizers do an amazing job of keeping things running smoothly. If you love helicopters, you owe it to yourself to go.